In the opening article of the first book to date dedicated to the work of Taiwan-based filmmaker Tsai Ming-Liang, Jean-Pierre Rehm claims that the title of the director’s fourth feature, The Hole (1998), “declares the terms of [the film’s] challenge”: “[H]ow do you leave a gaping hole open, without rushing to fill it with explanations, without plugging the gap”? (p.39) This question is pertinent both to an understanding of the poetics of the films of Tsai Ming-Liang, and the kind of challenge that they pose to those who seek to write about them. How do you account for the appeal of films in which nothing really happens; films which – despite their lack of plot – are full of moments of intensity which overspill the bounds of narrative? Tsai Ming-Liang (Paris: DisVoir, 1999) consists of two articles (“Bringing in the Rain” and “Corporal Interference” by Jean-Pierre Rehm and Olivier Joyard respectively), 51 stills, and a long interview with Tsai conducted by Danièle Rivière. Both of the articles are quite broad in their focus, and are built around a discussion of Tsai’s first four features: Rebels of the Neon God (1992), Vive l’Amour (1994), The River (1997) and The Hole. In their analyses of recurring themes and motifs (such as loneliness, eroticism and alienation, dripping water pipes and sparsely populated places) both Rehm and Rivière cover similar territory. 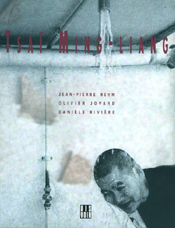 Where they differ, however, is in their analyses of the significance of – and spectatorial effects produced by – the everyday moments, gestures and spaces around which each of the films are based, in which Tsai’s characters wearily go about daily tasks such as washing, drinking, eating and urinating. In the first article, Jean-Pierre Rehm draws a comparison between Tsai’s films and those by directors such as Ozu, Kitano, Hou Hsiao-hsien and Antonioni (Tsai cites the latter as an important influence). While Rehm claims that the absence of dialogue and the prolonged presentation of actions and spaces that characterise the work of these directors function to create a sense of “plenitude”, he argues that the “painful succession of … shots” in Tsai’s films is “organized by dreary triviality” (p.34). Olivier Joyard, on the other hand, conceives of the role and effect of these shots somewhat differently. Far from being trivial or empty, he argues that they are characterised by a delicate sensuousness born of the characters’ attempts to adapt and re-adapt to the spaces in which they find themselves: “Sitting in a chair, choosing a bed, turning on faucets, opening doors, all of these everyday actions become sensual and emotional experiences” (p.53). In an article which is much more attuned to the centrality and affect of the workings of the body and its gestures in Tsai’s films, Joyard argues that when Tsai regular Lee Kang-sheng takes a bath, drinks from a water bottle, turns on a tap, or handles a watermelon, it is as if – like a child – it were the first time he was doing such things. In the interview with Rivière (in which the director is asked, perhaps a little too insistently, to account for “what [we] … are supposed to think” when confronted by certain recurring themes and motifs), Tsai foregrounds the importance of showing – in real time – the way in which a person relates to another person, task or event. “[T]he crucial thing”, he claims, “is to be in the moment, in that particular moment precisely … in ‘that’ space, ‘with’ those characters”. (p.105). ‘I want the audience to be able to feel the emotion, the atmosphere, as it develops while they are watching the film” (p.111). Spanning 25 pages and topics such as Tsai’s early work in television, his interest in Brecht, his fascination with self-observation, and the importance of realism, the interview provides the reader – as does the book as a whole – with a good introduction to Tsai’s strangely captivating films. At times, however, the interviewer’s desire to definitively pin down their ‘meaning’ may prove frustrating to those who take delight in their elusiveness. Tara Forrest teaches at the University of Technology, Sydney, and is currently working on a PhD in the School of Theatre, Film and Dance at the University of New South Wales.